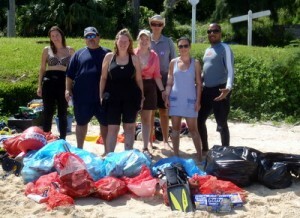 Six scuba divers hauled five bags of bottles and cans, plus three bags of trash from the water. They were aided by two more volunteers – one person on shore cover and another piloting a Boston Whaler boat. 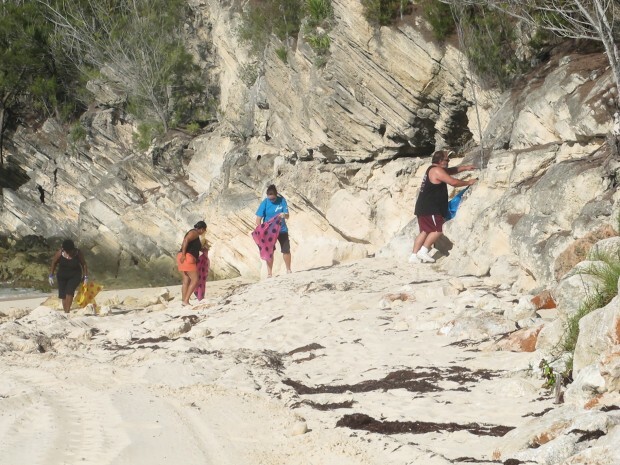 The club took part in Keep Bermuda Beautiful’s annual Marine Clean-Up, which coincides with Ocean Conservancy’s International Coastal Clean-up. The divers recovered most of the trash around mooring lines, the dock of Sandys Boat Club and the outer reaches of the bay. Among the items recovered were towels, sunglasses, keys, pieces of tubing, a trainer (sneaker), ladies’ scarf and plastic debris. Plastic can be mistaken for food by marine creatures and they can also become trapped inside glass bottles, so it is important to always dispose of your trash responsibly. Potential new members can also check out the club social evening from 8 pm on Wednesdays at the BSAC Clubhouse, Admiralty Park, Spanish Point (pink building). GREAT JOB KEEP THE GOOD WORK UP WE NEED MORE PEOPLE LIKE YOU THANK YOU FOR KEEPING BERMUDA BEAUTIFUL!!!!! !